IPEF and Ibá provide technical and institutional representation for the Brazilian planted tree sector. Together, they have developed three communication materials to spread awareness on best practices in integrated pest management and the use of pesticides in planted forests. 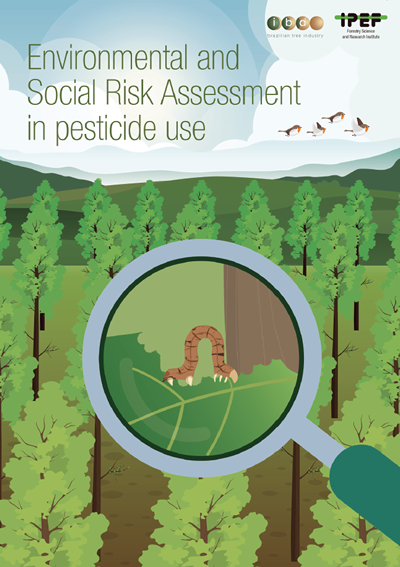 This infographic explores the concept of Environmental and Social Risk Assessment and the benefits associated with identifying, managing, and preventing risks related to the use of pesticides. This video explains how the concept of IPM combines different techniques to protect forest productivity from pest damage while safeguarding human and environmental health aspects. This video provides an overview of the biology, damage, and management caused by leaf-cutting ants, which are the main pest affecting forest plantations in the Americas. IPEF was established in 1968 and is a nonprofit association engaged in planning, implementing, and coordinating actions and resources for the scientific and technological development of the Brazilian forest sector. IPEF is structured upon cooperative programs grounded on the interaction between universities and its 23 associated companies on topics such as forest certification and forest protection. The Cooperative Program in Forest Certification (PCCF) is responsible for supporting companies so that they can achieve and maintain socio-environmental certification, and acts as a direct channel for communication with the certification systems, contributing to and working towards a technical and scientific foundation for the normative frameworks. The Cooperative Program in Forest Protection (PROTEF) promotes integrated management of forest pests and diseases, with an emphasis on studies of insect pests and plant pathogens that also consider economic, social, and environmental aspects. Ibá is the association responsible for institutionally representing the planted tree production chain, from the field to the industry with its main stakeholders. This association represents 55 companies and nine state entities that provide products obtained from planted forest. Iba’s mission is to increase competitiveness in the industry and align member companies with the highest standards in science, technology, and social and environmental responsibility for the entire planted tree production chain, pursuing innovative solutions for the Brazilian and global markets.